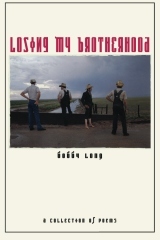 LOSING MY BROTHERHOOD is British singer-songwriter Bobby Long’s first collection of poems. He released the book in May of 2012, complete with several drawings by artist Ben Edge. Long has said himself that the book is meant to be a farewell to a particular era in his life, when friendship was all he and his mates had to get by, but in truth, this collection is so much more. Those familiar with Bobby Long’s music are aware of his deep regard for history, specifically industrial England and the wars his country has suffered. While he didn’t live these things, he certainly relates to them, and this fascination translates beautifully into poems about his life. His dreams of today are superimposed over the bleak backdrop of these eras. Understanding turns even the simplest poem into a ballad fit for any time, where we hear the voice of the battled soldier or the downtrodden factory worker. As with his music, Long’s fascination with death is woven between words of romance, friendship, and deepest regret. In some, the dying man is a hero; in others, he gets his just reward. He doesn’t glorify or vilify, but instead gives careful respect to the power of death, a hint of fear with a larger dose of awe. There is no hope to the message, but rather an acceptance of what is and what will be. Life is breathed into the settings, even if the picture painted isn’t a pretty one—the plastic of Hollywood, the dirt of Manhattan, the damp of his childhood home, and the enormity of his new country. With a few short words, Long brings us into his world, if only for a moment, and shows us exactly what he sees. We can’t deny the truth in his words and must accept that he sees the beauty, the need for these places, underneath the tarnished exterior. Bobby Long shares the deepest parts of himself in this quiet, careful collection of words. Where he could be highbrow, he is genuine. Where flowery might work, he gives us grit. Never once does he back away from a subject, even when he is that subject. He owns up to his heartbreak and the heartbreak he’s caused in others. He makes no apologies for missteps in his past and present—doesn’t even try to teach some kind of lesson with the words he shares. He gives us love, pain, hope, frustration, disdain, life, and death. Some of the poems are simple in their execution, while others require a deeper look into the meaning and the message. All are stunning in their honesty. You can find this collection on Amazon or on Bobby Long’s website. What a wondeful review for a great collection of poems. I have been a fan of Bobby’s for a bit over 3 years now, and am happy to say it has been fascinating watching his growth as an artist. Bobby’s words, whether in poems or songs, speaks to the soul, and makes us think about the deeper emotions and realities of life. This collection does not disappoint. I have been a fan of Bobby for a few years now also and am so glad he did this book of poems. My husband and I have discussed what some of his songs actually mean and I am sure we will do the same with this book. His words and his music is a breath of fresh air in this “pop” world with bubble gum music. I am soooo thankful for him and Marcus. Without them, I would have no music to listen to.